Informant is my mother who loves riddles. She is known to challenge entire dinner parties with this one riddle, often with nobody able to solve it. She presented this one at a family dinner because there was a guest present who hadn’t heard it before. She says she didn’t make it up but doesn’t remember where she heard it. She thinks she probably learned it from her father when she was younger, living in Cherry Hill, NJ. Q: Name three consecutive days without using these words: Monday…….Tuesday…….Wednesday…….Thursday……Friday. I think what makes this riddle memorable is the misdirection in the instructions. Of course, the trick is the use of the word “days.” Because of the nature of the trick, when you know the riddle it’s painfully obvious, but without knowing it can be hopeless. Before one has heard the riddle (like any riddle), the right answer is unclear. But after hearing the solution, it seems so obvious. I think it’s like an initiation to her, a rite of passage at the communal dinner table. Informant (L.P.) is an 18 year old student. I had heard her enthusiasm for telling ghost stories the week before, and this one stood out. L.P. works at a local novelty shop. This interview is conducted at my house one Saturday evening. I ask about the ghost in her workplace, which she had mentioned during our previous encounter. L.P.: “It used to be a post office, so maybe somebody died in there I’m not sure. I ask her if she’s has the video, but she says no, as she doesn’t have access to the work computer. As the youngest employee at Wacko, I’m assuming L.P. is going through a right of passage in learning the store’s occupational legend of Toots the gaseous ghost. I aksed one of my catholic friends if she had any traditions that her Church did. Me: Really, just whatever you have. Informant: All right. I was just considering talking about Confirmation. Cause, I’m Catholic, well sort of-ish. I haven’t gone to church in a while, or done anything real religious in a while. But, maybe then I can talk about…Do you want an overview of what it is? Me: I know more or less what it is, as I did go to a Catholic school for several years. Informant: Then do you want a specific part, maybe what the actual ceremony is like? Informant: Okay. ‘Cause it is a two-year thing, well at least in my church. It might vary from church to church. And some places, the times at which you do confirmation vary some. Like some Catholics would do it younger. But I didn’t go to Catholic school, I just went to the church nearby. Me: Yeah. At my school, we had the preparation for Confirmation, the class that would prepare us for Confirmation in eighth grade. Informant: Today is the 26th, right? Me: 25th, I believe. Okay. So just start talking then. So I went through something similar. I’m not Catholic but I am Protestant, but we went through a “Confirmation of Faith.” I remember that what we did was we wrote up a statement, like a one-page paper essentially confirming our faith. Informant: Yeah. We did something like that, but it was more to choose your “saint name” – you had to research he saints, find one you liked and then do a little report on them and why you picked them. Me: Interesting, ’cause I remember that my statement of faith was not what everyone else’s was like, what people were expecting. ‘Cause I did my confirmation of faith in my ninth grade, and we were studying the scriptures in our religion class in school. And so my statement was completely different from most people. ‘Cause most people were like writing about how the church has changed them, how they have so many fond memories of the church. I wrote about, I can’t even remember what exactly I wrote about, but it was completely more academic. It was like entirely academic or something. Informant: Well the point of confirmation that they told us was that they wanted you to, it was when you become an adult in the eyes of the church. So you could go up and do readings for the church, you can serve the church in ways that you couldn’t before, when you weren’t confirmed. I mean, I can’t remember precisely what you were allowed to do after you were confirmed besides read in front of the church during the masses, it was probably organizing fundraisers or something like that. Anyway, that’s what they told us, and that’s why, instead of baptizing us in front of the church, which doesn’t count, because it is not performed with you’re consent, as you’re like only a baby, you have no idea what’s going on. Me: Yeah, I know that that is one of the reasons why some religions wait until their children are old enough to be able to give their consent to baptize them. Informant: I guess the thought was that you were baptized, but weren’t really thought of as a member until you were confirmed. So that was the point. Basically the way Confirmation worked was that you went to class on every other Sunday after church. You would all go to ten o’clock mass, you would all have to go to mass together, and when you were at mass, the people who were in confirmation were the ones who did the ushering, passed the collection plates around, brought the bread and wine up to the altar. So we would all have to go and show up for ten o’clock mass. And at my church ten o’clock was like the mass where you dress nice. Normally my family would go to eight o’clock because all you had to do was go there for an hour, hour and a half, get communion, and leave. But for ten o’clock mass you had to dress nice and you had to stay the whole time, cause you were in confirmation class, you couldn’t just leave early. And after that you had a class. The class was…it was about…they had this little Christian magazine thingy that they gave to you that you had to read through it. It had different aspects of the faith, different moral values, that kind of stuff. But mostly you had to do a lot of service – a lot of community service. Informant: Yeah. It’s, actually during a lot of the time that we were talking about the magazine thingy we would do some kind of service thing. You had to do a certain amount of hours and there were all kinds of events that you could go to. Like, there was the winter sweet shop thing where you would help to bake cookies and would then help to sell them at the bake sale later that week. And the Easter thing where you would help plan the Easter egg hunt for the little kids who went to the church, and have a little Easter baskets and set up the place and stuff Easter eggs. Those are the two that I remember the most but there were other ones. There was one on Thanksgiving where we made lunches for the homeless, and another one where we made cards for Christmas or something. I can’t remember exactly. Me: Yeah. I remember that we did community service in our youth group at church. Informant: Yeah. That was more or less it. It’s been a while after all. I do remember that one of the other important things was that you had to go up and read in front of the church, ’cause our church, and I’m not sure if it is structured differently with other Catholic churches, but there are three readings, the first two are from the first part of the Bible and the third one is the Gospel. Me: Oh yeah. That’s pretty standard. Informant: Yeah. So you had to go up and read one of those two readings and you had to do it at least once or once per year. And the first one that I had to do was the Palm Sunday reading, which was this really long reading right before the Gospel, and it was also the narrator which was the longest part. That was terrible. Thankfully, the people at church are forgiving, and said that I did fine. And one of the things that we had to do was we had to pick a saint name. We were told to go on the internet, to look up the different Catholic saints, choose which one you liked and have a one-page paper about who that saint is, what the represent, and why you picked them. Informant: Yeah. So the one that I picked was Lucia, the patron saint of eyes, writing, light, and in her story, she was betrothed to this pagan person and she refused to get married to him so he had her eyes cut out, but she could still see without them, thus why she is the patron saint of eyes. Although, personally, I question, I guess, what’s so brave, still, there are braver things than being mutilated and dying. But maybe that’s just me. Also, it’s kind of funny that I have terrible eyesight and I chose the patron saint of eyes as my patron saint. Informant: So for the actual ceremony, which was at the end of the second year. It would be at a different church entirely and you would go with other churches who were in the same dioces. What I remember is that you had to dress nicely, but not fancy ballroom nicely, just church clothes nicely. You got a robe and you went in there for service with the bishop of the dices, and you stayed there and you would all go in a line. At least our class in particular had to do readings. After that, you come down, you are blessed as your saint name, you are a member of the church, shake hands with the bishop and then you leave to celebrate with your own families. And that was Confirmation. The practice of confirmation became a tradition most likely around the time that people began baptizing children when they were infants, rather than when they were adults. There are three important milestones in a Catholic’s life, at least in terms of the church – baptism, which is performed soon after birth, first communion – which happens at about 7-8 years old, the “Age of Reason,” and confirmation – which happens around 14-16 years old. Confirmation became a tradition because it was the ceremony, the sacrament that made a person an official member of the church. Confirmation is a ceremony in which a person simply states their faith for the entire congregation to hear. It is a right of initiation, and those who go through it are then seen as adults in the eyes of the church, and anyone who is not confirmed will forever be seen as an outsider to the church, never a full member. It is a right of passage into adulthood, at least in the eyes of the church. When I was a kid we would do this thing called “El Camino de Santiago” which is a walk that actually goes from France all the way to Galicia in Spain—Santiago de Compostela—but instead of doing it like that, we would make a route around my city, around Toledo, starting at one of one of the outside little towns and finishing at the top of the city. 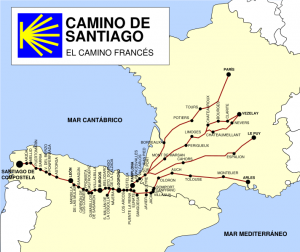 El Camino de Santiago appears to be a rite of passage that connects young Spaniards with the countries historical past and inaugurates them into Spanish society. Everyone in Sergio’s city—Toledo—participates in this event, as do many others throughout Spain. Whereas few people male the full trek from France to Santiago de Compostela, the majority complete shorter walks that are meant to represent the long journey between the two countries. Santiago de Compostela is a city in northwestern Spain that is known to be the resting place of Saint James. In the past, El Camino de Compostela was an important Christian pilgrimage akin to the pilgrimage made to Jerusalem by Jews. As the majority of Spaniards complete a shorter version of the walk it can be related to a shorter canonized version of a longer folktale in which the essence of the tale remains but details are altered here and there. Sergio has completed this shortened walk many times but has no intention to make the full journey from France. It is a tradition that his family has upheld for decades. Since they moved from Spain to Miami they no longer continue to make this short trek around their city. I am not aware of any walk in the United States in which the walking represents walking done in the past. There are many charities that use the act of walking to raise awareness and money, but there exists no walk, for example, that represents slaves walking from the deep south to the north with the hope of achieving freedom or of Lewis & Clark walking to the pacific ocean and back. El Camino de Santiago appeared in the 2010 film The Way (directed by Emilio Estevez and starring Martin Sheen), which tells the story of father who heads to Europe to collect the body of his son who died while making the trek from France to Galicia. Once he arrives he himself decides that he wants to make the trek himself to both avenge his son and test his limits. For the father this walk journey is not so much a rite of passage as much as a challenge he presents to himself. So I asked the next logical question, did he do it? My favorite piece of folklore that I collected, I really couldn’t have asked for better. It’s a rite of passage that’s become traditional for these Salt Lake teens, and best of all my informant actually went through it. I suspect Emo’s Grave has proliferated because of the aesthetic of the site itself, bolstered by these ever increasing accounts of people visiting the grave under the right conditions. Along the way Friday the 13th got tied in with this death-based ritual, as well as the rule of three. I love the way my informant seems perfectly aware of how amusing and perhaps slightly ridiculous the whole thing might sound, but when talking about his own experience at Emo’s Grave is sure that, as far as he can tell, things happened that he couldn’t rationally explain. A testament to the power of folk rituals.